The idea is simple… the elevator doors open, you step inside, only to find yourself alone with a top executive… You have 90 seconds to get them to accept your business card! This micro workshop, based on the popular myth of writers meeting execs in elevators, is a great opportunity to try out your fabulous 90 second pitch. You might get an invite to submit your work, you might not… but you will certainly get an experience you won’t forget! 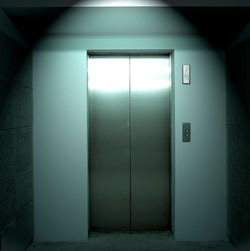 The session runs on a first come first served basis, and you will only find out who is in the elevator when you step inside. Feel the fear…. And do it anyway!